Will Dallas' gamble for the tech company pay off? Amazon won’t announce a final decision on where to build its much ballyhooed second headquarters until next year, giving us plenty of time to speculate, second guess, and chide the Dallas Regional Chamber for not sharing its bid with the public. In the Dallas Morning News, business columnist Mitchell Schnurman notes that the North Texas bid did not rank or prioritize the more than 30 proposed Dallas-Fort Worth sites, drawing an unfavorable comparison to Boston’s publicly available pitch, which hones in on four potential locations for the tech company. That seems a fair criticism, but whether or not Joe Pleb ever gets to see Dallas’ Amazon pitch, it’s done. No going back. No edits. In the mail and in the hands of Jeff Bezos. Nothing left but to take bets. We’ve written here about the many analyses of which cities are likely to land HQ2, consulting the wisdom of the New York Times and Moody’s Analytics, among other sources. But is it possible the most clear-eyed analysis will come from those with skin in the game? From the gamblers? 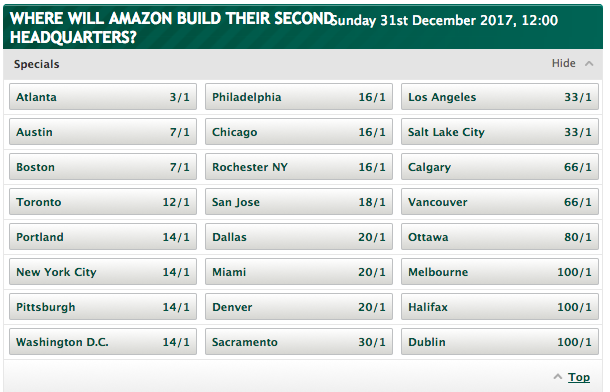 Here are the current odds given at Paddy Power, an Irish online bookmaker that is letting residents of countries where this kind of thing is legal bet on where Amazon will go. Dallas gets 20 to 1 odds, on par with Denver and Miami. Not too shabby, but the frontrunners in this extremely unofficial assessment are Atlanta, Austin, and Boston. Is it worth betting on Dallas?